This apple peel smoothie is full of fiber and a great way to use up holiday recipe leftovers! Have you ever made a holiday recipe and ended up with a pile of apple peels? Never fear; they're delicious and full of nutrition and fiber, if you find the right way to use them. (That's why we love our Vitamix blender!) If you hate wasting good food, grab that pile of deliciousness, combine it with that bare looking orange (or lemon) you zested, and add some frozen berries. 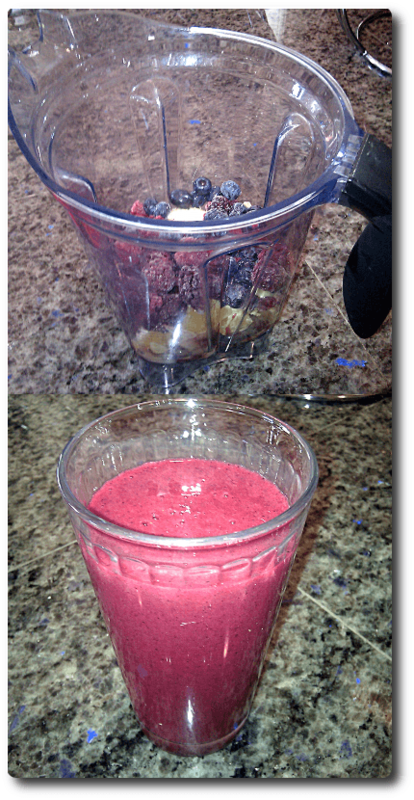 The result is a super healthy smoothie that'll give you energy to continue cooking and baking. Dump the apple peels into your blender. Add water. Peel and add the orange. Add the berries. Blend until it reaches your desired consistency. Add the orange as-is, if you don't mind the peel. The result will be a little thicker and chewier, depending on how much water you add. As always, you need at least 1/4 cup of water, but you can vary that amount as you prefer.